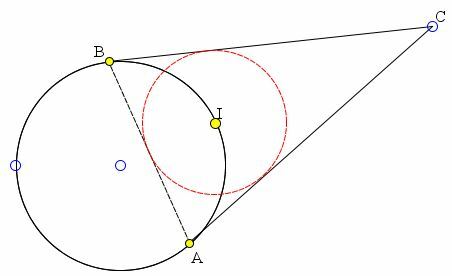 The tangents at points A and B on a given circle Γ intersect at C. Show that the incenter I of triangle ABC lies on Γ. Let I' be the midpoint of the small arc AB of Γ. The arcs AI' and BI' are equal. The inscribed angle ABI' equals half the arc AI', angle BAI' equals half the arc BI'. The two angles CAI' and CBI' between the tangents to Γ and the chords AI' and BI' equal respectively half the arcs AI' and BI'. It follows that ∠CAI' = ∠BAI' and ∠CBI' = ∠ABI' (all four are in fact equal.) 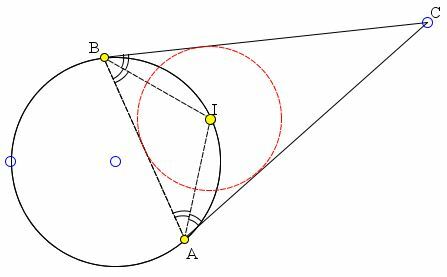 Thus AI' and BI' are angle bisectors of the angles at A and B of ΔABC, making I' = I, the incenter of the triangle.